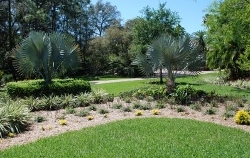 Florida's Green Thumb is a locally owned and family operated lawn pest control company. Chances are that you have had a previous company (maybe many) and you have been discouraged by the results. The fact of the matter is that in Florida, lawns and plants can be very difficult to maintain due to the extreme weather conditions, and you also have to deal with the pests that go along with them. Unfortunately larger companies can not provide the same quality service a smaller one can for many reasons. The main reason being is that 99% of the technicians that work for larger companies do not even have a pest control operator's license, in fact they most likely know less about your lawn than you do. Larger companies have a very high turnover rate (You probably have a different technician there almost every time) and they all work underneath the MANAGER'S license. The truth is it takes years of seeing different pests on different plants all in different situations before you can have the ability to identify a problem before it gets out of hand. Florida's Green Thumb guarantees that you will have a LICENSED technician every time. Give us a call today and stop the days of having someone apply "whatever is in the tank" on your lawn or plants. Thanks for visiting, we appreciate your business. All content Copyright© 2009 by Floridas Green Thumb, Inc.